S A Y A Designs creates unique, handcrafted hair sticks, hair slides and hair forks from root wood salvaged from plantations in Indonesia. We take a waste material and turn it into something beautiful and purposeful. 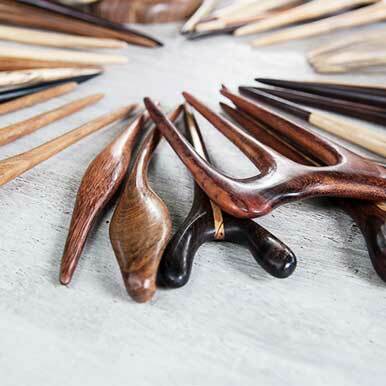 Designed from nature, handmade by artisans in Bali, and backed by a passionate commitment to the environment, these are hair sticks on a mission. Hair sticks are the original hair tool and have been used for thousands of years. They are durable, created to last and an alternative to plastic and elastic. Each SAYA hairpin is inspired by the rich flora and fauna in Indonesia, and designed to directly reflect local plant life. They are carved by hand by Balinese artisans, sanded down to the finest grain using simple tools and techniques, and finished with natural wax and oils. Wood is only a renewable and eco-friendly material if it is consciously sourced. Tropical hardwoods, in particular, grow very slowly and in low densities, and regenerate poorly after logging. These species are often taken from forests in non-sustainable numbers, and illegal ways. Searching for a way of sourcing wood sustainably, SAYA Designs came across Made & Ways, sculptors who dig up and recycle root wood from old commercial plantations all across Indonesia. I work with two independent woodcarvers. The Balinese often work from home in their family compounds, with basic tools and machines that are used for a variety of woodworking trades. In terms of conditions, this is their home where they are among their families. I am in regular contact on the phone with these men via skype. They are paid well above the living wage for Bali, let alone Indonesia, as Bali is the highest paid island in the archipelago. Our hair sticks arrive in recycled packaging made from papaya pulp, with a protective fabric sleeve to keep it safe when traveling.